The cornerstone of the FEMSA Group is Cervecería Cuauhtémoc Moctezuma. This company was founded in 1890 by Don Isaac Garza and Don José Calderón, who were both distinguished in their work ethic and entrepreneurial spirit. They were later joined by Don José A. Muguerza, Don Joseph M. Schnaider and Don Francisco Sada. These gentlemen laid the foundations of a company that would later become one of the largest beer-producing groups in the world. The production facilities of Cervecería Cuauhtémoc Moctezuma have been expanded continuously, and now consist of seven plants in Mexico, located in Orizaba, Monterrey, Toluca, Navojoa, Guadalajara (2) and Tecate. 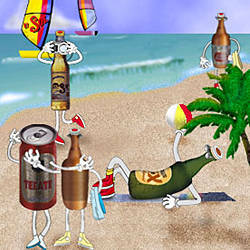 The company offers the largest range of beer brands in Mexico, satisfying every possible consumer in the market with brands such as Tecate, Sol, Dos Equis Lager, Dos Equis, Carta Blanca, Tecate Light Premier, Superior, Indio and Bohemia. In September 1994, Cervecería Cuauhtémoc Moctezuma formed a strategic alliance with the Canadian brewery, John Labatt Limited, thus integrating into a more competitive market and consolidating its participation in the most demanding world markets. Under the terms of the agreement, Labatt acquired 22 per cent of FEMSA Cerveza, S.A. de C.V. for US$510 million, with the option to acquire an additional 8 per cent of FEMSA Cerveza, during the next four years.